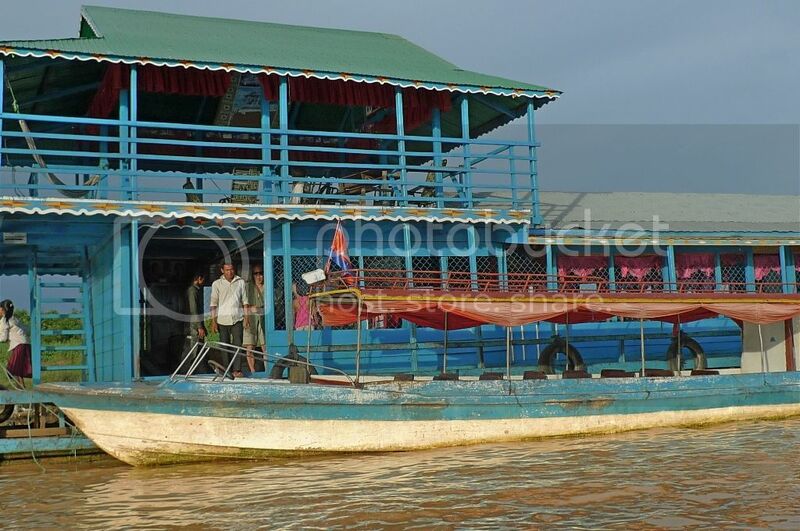 On our third day in Siem Reap, we went on a cruise at Tonle Sap Lake. 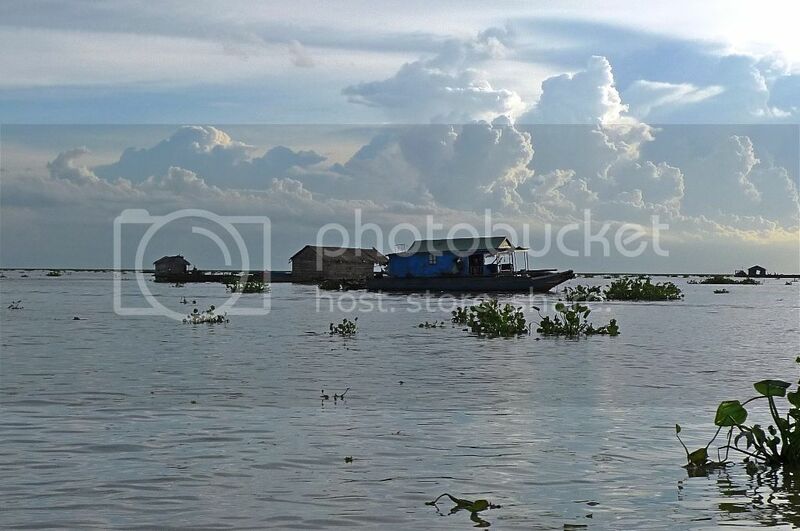 Right after leaving the ruins of Beng Mealea in the afternoon, our driver Xiao He drove us to Tonle Sap. 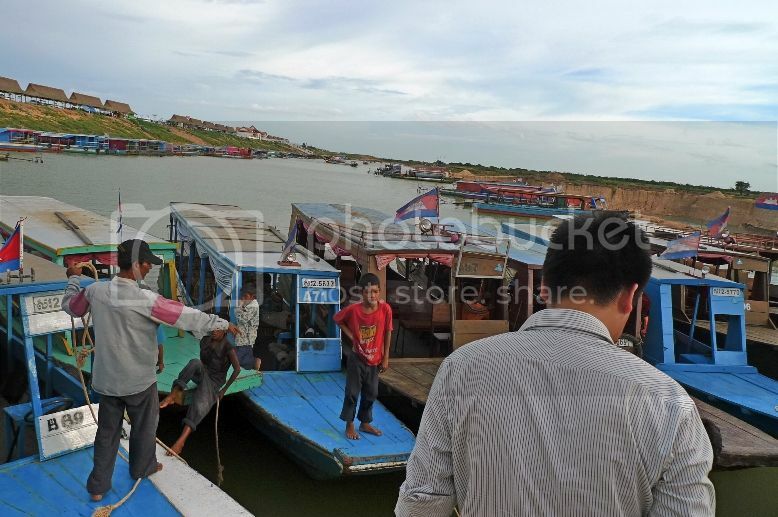 We arrived at the Chong Khneas boat dock which is located about 13 km from Siem Reap at about 5 pm. There were many boats docking there! Not far from where I stood was a bridge walkway leading to the boats below. 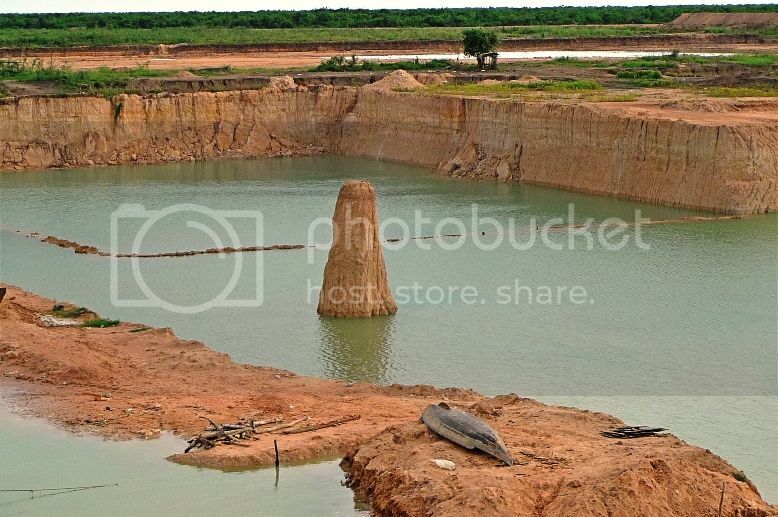 View of the man-made reservoir next to the canal. 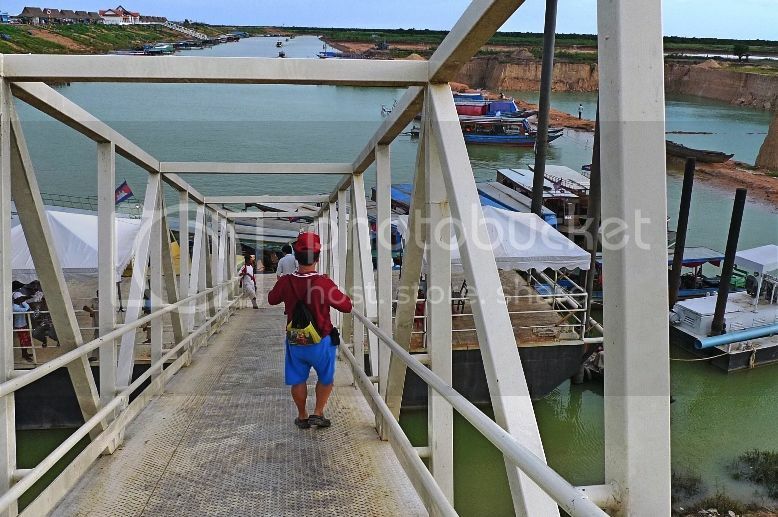 After paying USD10 per person for the cruise trip, we walked down the walkway. The view from the walkway. When we reached below, there were many boats waiting there. 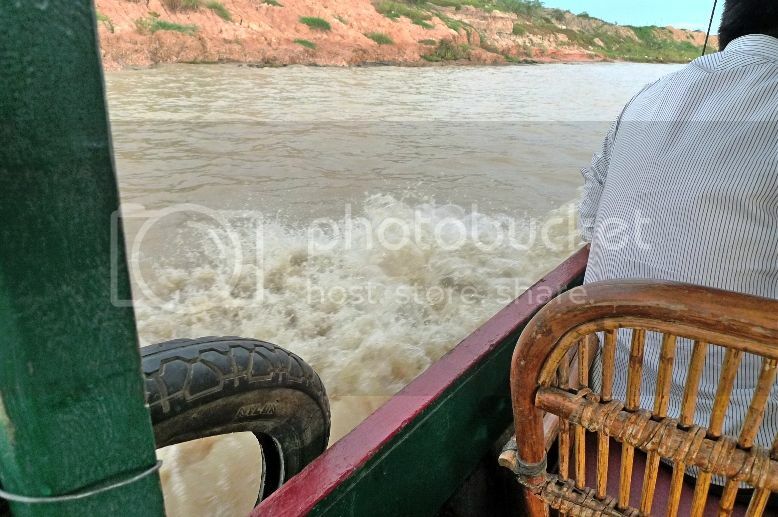 This time, our driver Xiao He joined us as he would be bringing us to a place in the middle of Tonle Sap to see the sunset! We got onto a boat with Xiao He and two boatmen. 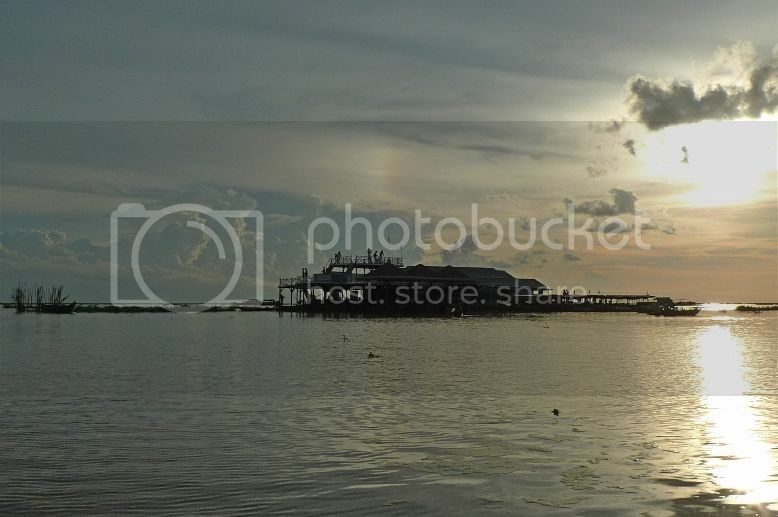 This is the view of the dock from the boat. As we left the dock far behind, I took 0ne last snap on my camera. Cruising along the canal was fun! However, I had to be careful not to let the water from splashing onto my camera! Our two boatmen in front were steering the boat while Jam, his friend and I were busy taking pictures! It is however, a rather unusual lake as its flow changes direction twice a year. 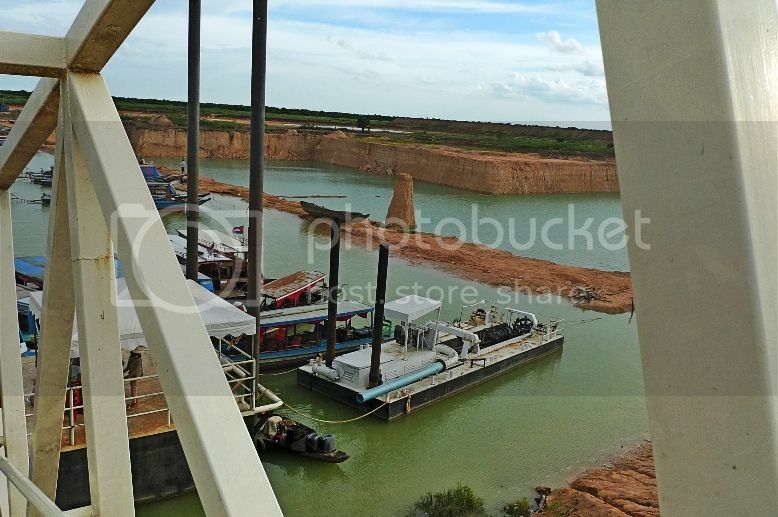 During the dry season from November to May, the water in the lake drains into the Mekong River at Phnom Penh. The lake shrinks in size during these months. 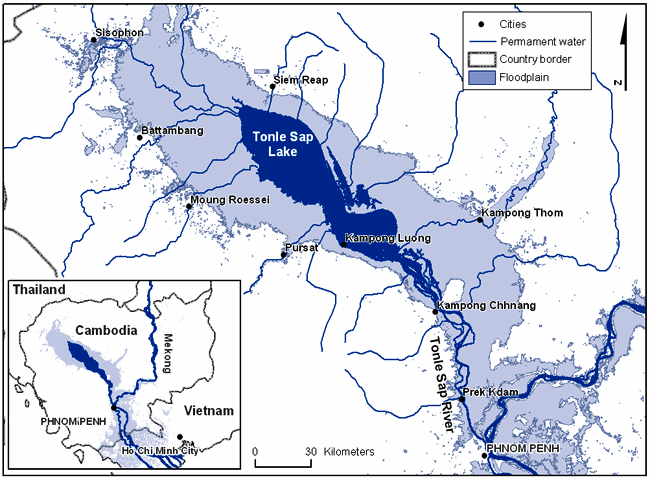 But during the wet season from June to October, water is pushed up from Mekong River into Tonle Sap Lake, expanding its size enormously from a mere 2,700 square km during the dry seasons to a whopping 16,000 square km! 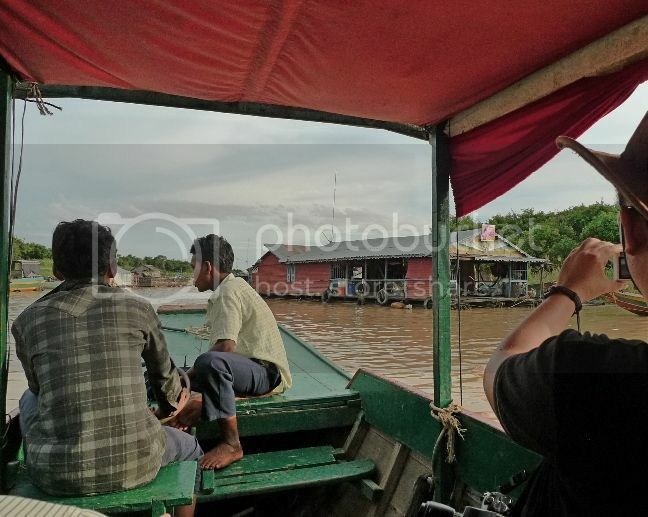 After about half an hour cruising down the canal, we soon reached a floating village. 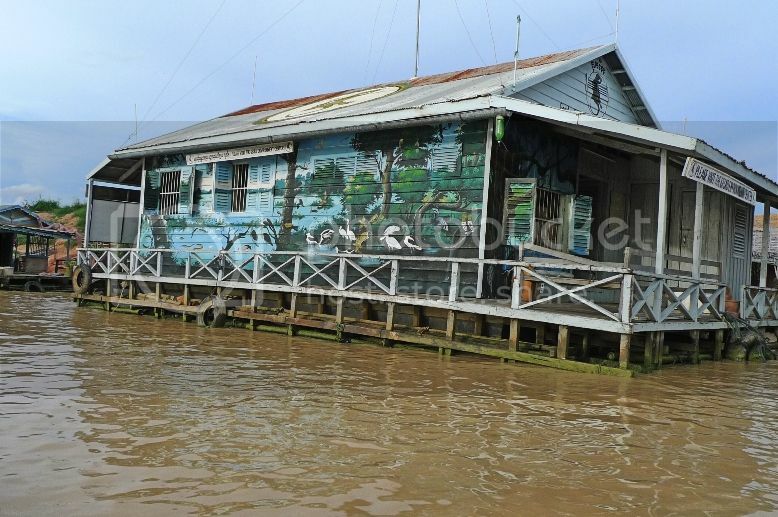 There were many floating houses along both sides of the river banks - probably hundreds or thousands of them! 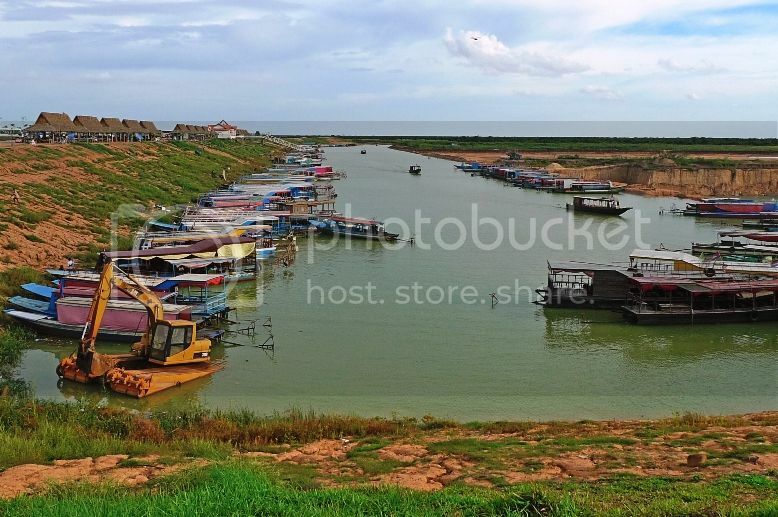 These are homes to the ethnic Vietnamese people. 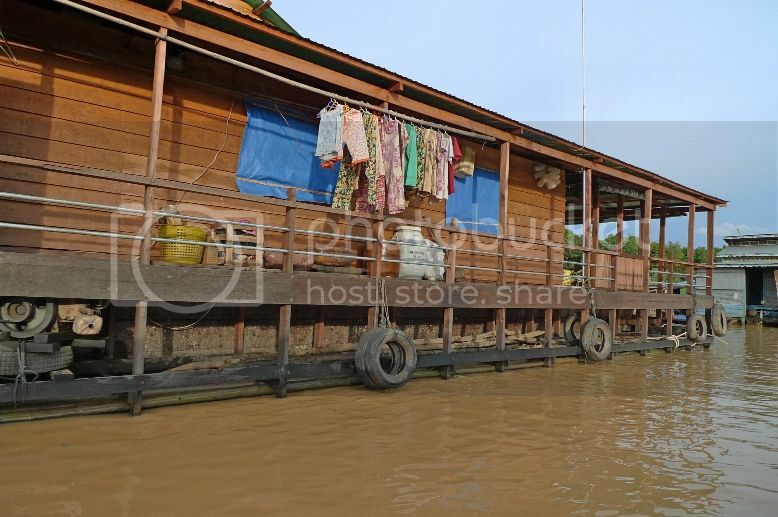 All the floating houses were made of wood and they were tied to a kind of structure to prevent them from being washed away by the river water. OK, is this how they prevent their boat from floating away in the water? We passed by an interesting looking floating house. 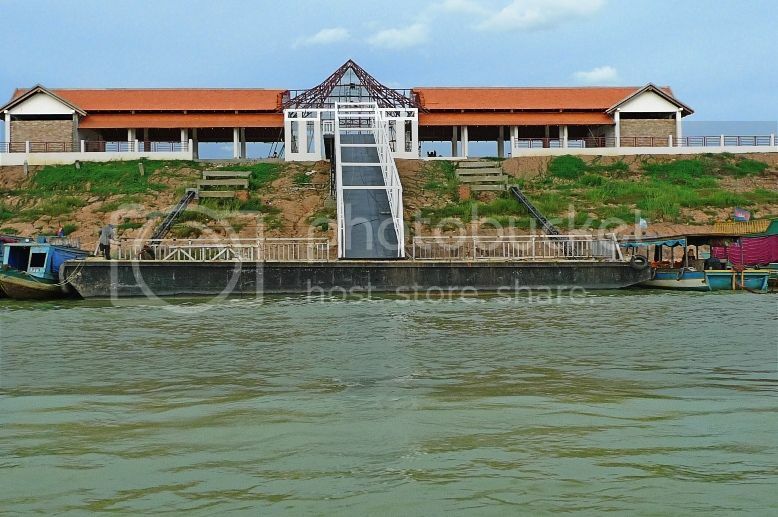 It is known as The GECKO Environmental Education Centre which provides informati0n about the human society and unique ecology of Tonle Sap. 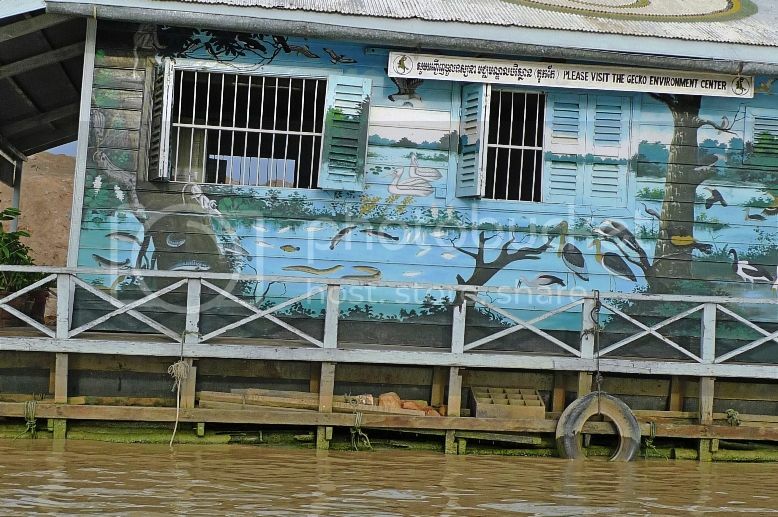 Look at the nicely painted wall of the floating house! We however, did not stop to step into this house. 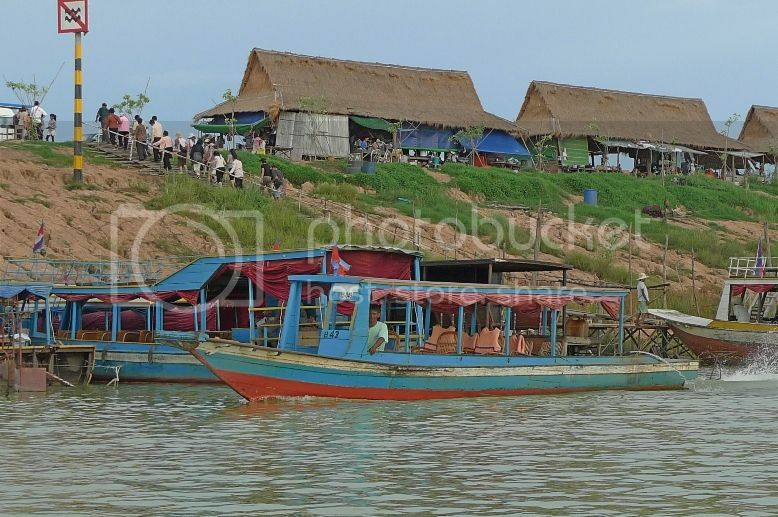 It's really an experience cruising down the floating village. The water looked pretty dirty to me but the people living in this village used this water to bathe! If you are one who always complain about the slightest discomfort in your modern daily city life, visiting this place will make you think twice about complaining in future! Oh wait, is that a church?! 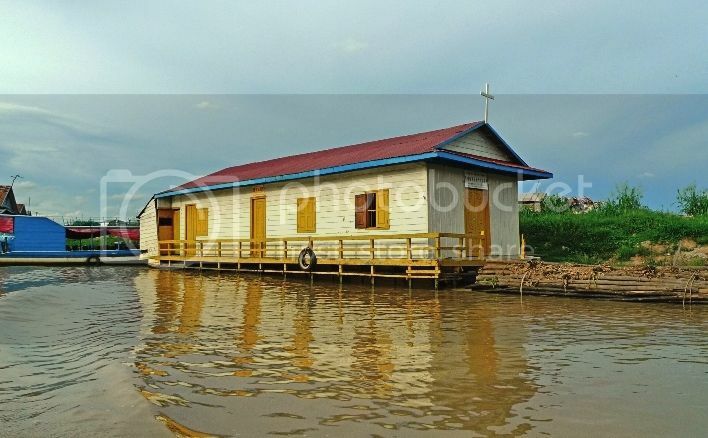 Oh my God, yes they have a floating church too! I really don't know if I can ever live in such a condition, but that's how these people live everyday. I must be thankful always for leading a more fortunate life. 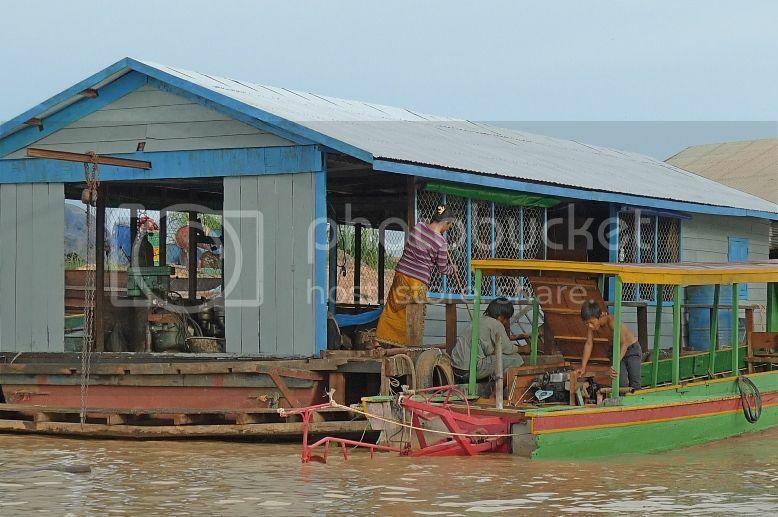 The floating village also came with a school to educate their children. 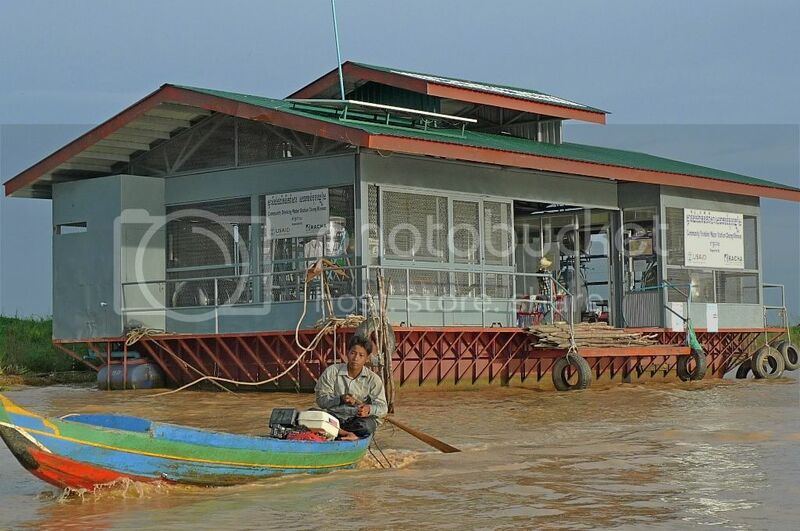 It's a floating school. Wow! 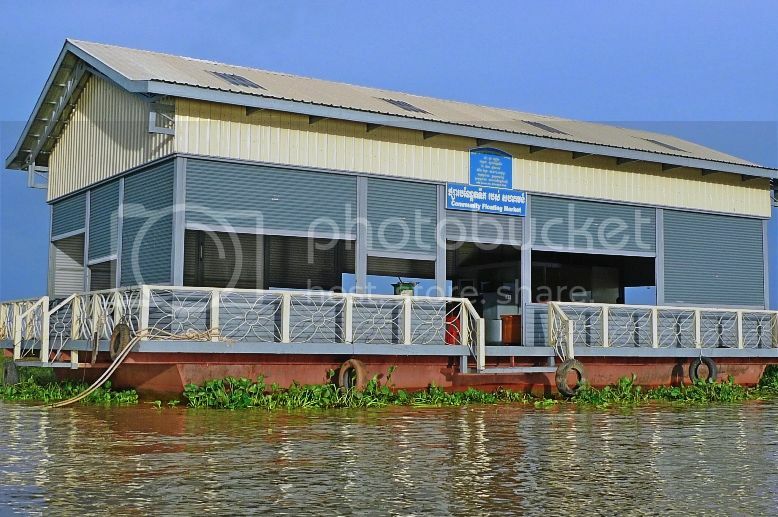 Have you ever been to a school that floats on water? 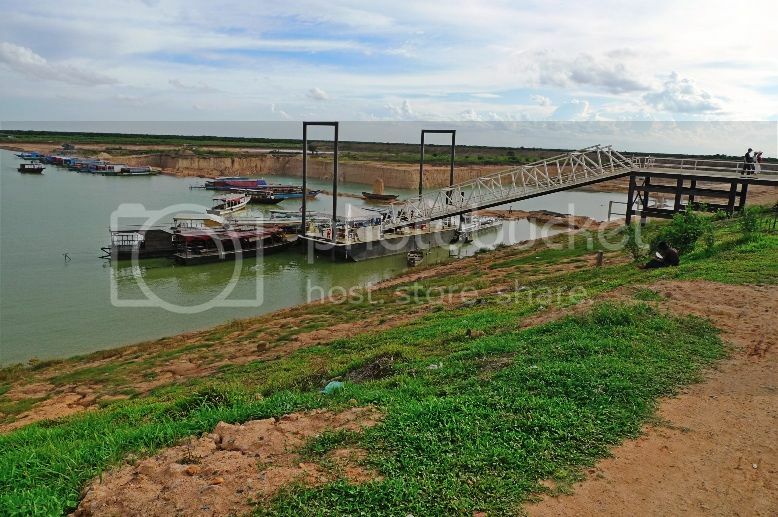 I think the Government of Cambodia helps to provide clean drinking water to this community. I mean, surely you can't expect these people to be drinking from the dirty river right? 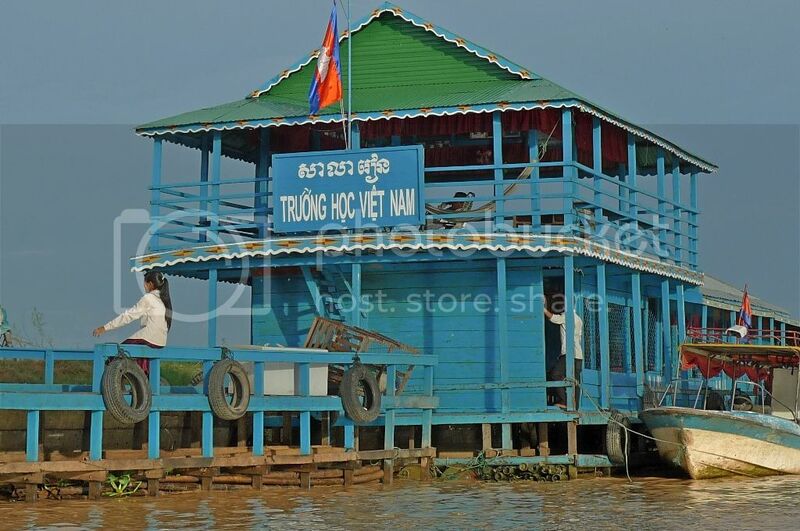 Below is the floating building that houses the community drinking water station. 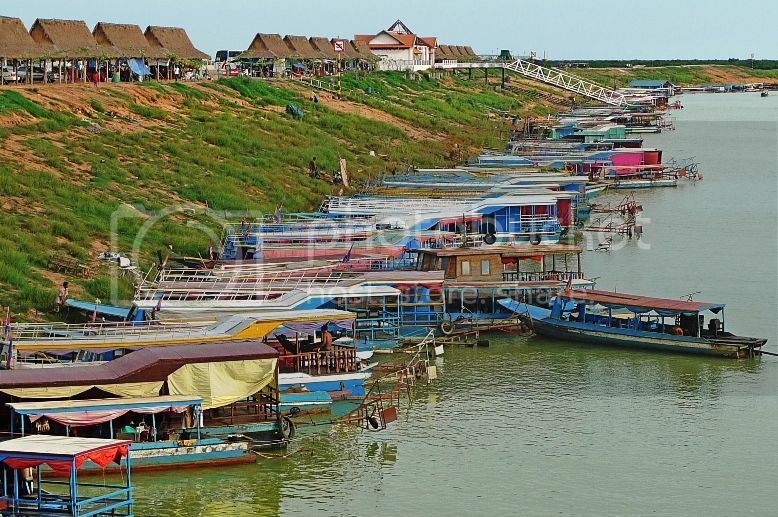 The floating village is sort of self contained. Some of the people here probably have never even stepped onto land before. It's a rather sad story to me. So besides a floating church, floating school and floating water station, what else do they have? A floating market of course! We did not see anyone at the floating market when we passed by - probably the market was closed since it was already in the evening. Can you see the wooden sticks structure jutting out of the water in front of the house below? 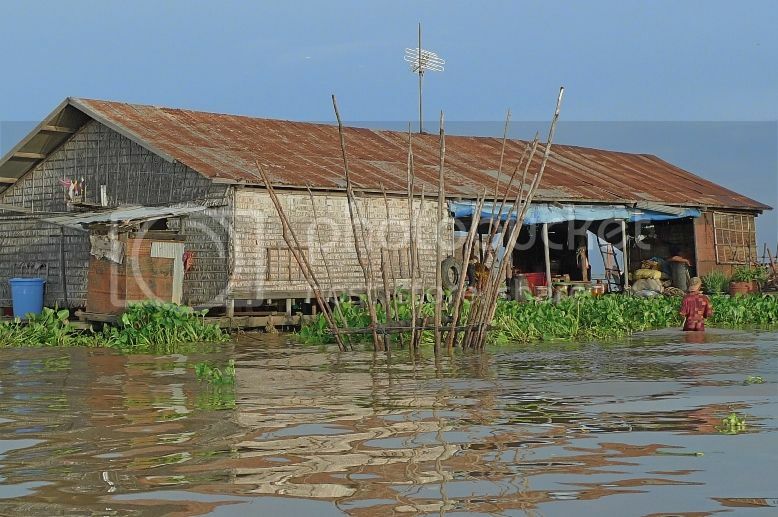 The people tie their floating houses to these structures so that their houses do not float away with the flow of the river currents! 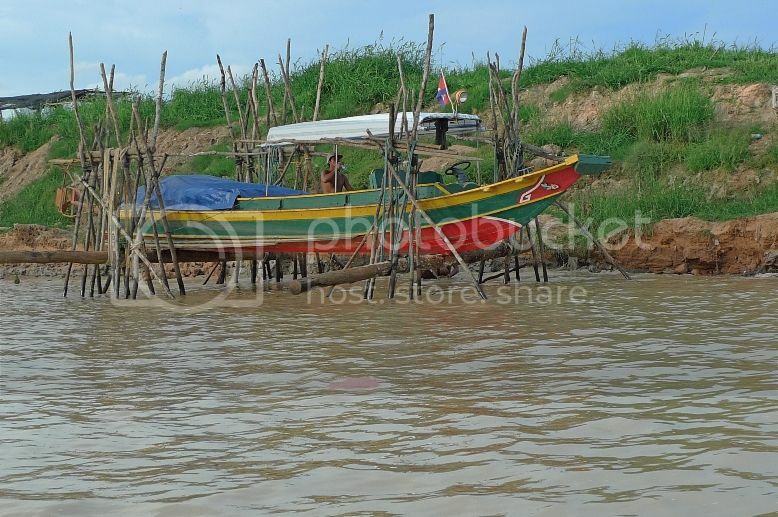 Soon, we reached the larger part of Tonle Sap Lake. There were not many floating houses here but I could see floating plants! From the distance, we could see a floating structure. According to Xiao He, our driver-turned-tour guide, we would be stepping onto that structure to view the sunset. We would soon discover that there were more about this structure than meets the eye.